June 17, 2016 – Boston, MA – The Environmental Business Council of New England (EBC) is pleased to announce the election of Thomas A. Mackie, Managing Shareholder of Mackie Shea, P.C., as the Chair of the EBC Board of Directors. A Board member for 13 years, Mr. Mackie most recently served as Vice Chair of Membership on the Executive Committee of the Board of Directors and served as Committee Chair of the Solid Waste Management Committee for over five years. 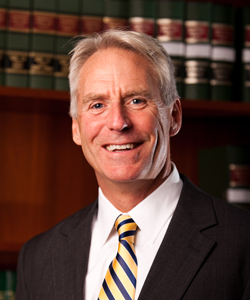 Mr. Mackie is an environmental business lawyer with the Boston-based environmental law firm Mackie Shea, P.C. For more than thirty years he has provided advice to businesses and municipalities facing complex environmental issues. He also handles numerous facility siting, permitting, regulatory compliance, enforcement defense, liability and insurance coverage cases with environmental components. As an environmental mediator Mr. Mackie has successfully mediated several wetlands disputes for the Commonwealth of Massachusetts. Mr. Mackie has led the environmental due diligence in several Corporate acquisitions and mergers, most recently involving the acquisition of over fifty licensed hazardous waste facilities located in 31 states and Canada. These projects regularly involve the evaluation of myriad environmental liabilities, permits and licenses for industry leaders. He has chaired or served as a panelist on numerous committees and seminars on solid waste and environmental liability issues for the Environmental Business Council, Boston Bar Association, and Massachusetts Continuing Legal Education. He is the author of “Solid Waste Law and Regulation” in Massachusetts Environmental Law which is widely regarded as the leading treatise on environment law in the Commonwealth of Massachusetts. Mr. Mackie was voted in as Chair of the EBC Board of Directors at the EBC’s 26th Annual Meeting on June 16, 2016. He will serve a two year term.